Despite expression of the high-affinity IL-2R, CD4+CD25+ regulatory T cells (Tregs) are hypoproliferative upon IL-2R stimulation in vitro. However the mechanisms by which CD4+CD25+ T cells respond to IL-2 signals are undefined. In this report, we examine the cellular and molecular responses of CD4+CD25+ Tregs to IL-2. IL-2R stimulation results in a G1 cell cycle arrest, cellular enlargement and increased cellular survival of CD4+CD25+ T cells. We find a distinct pattern of IL-2R signaling in which the Janus kinase/STAT pathway remains intact, whereas IL-2 does not activate downstream targets of phosphatidylinositol 3-kinase. 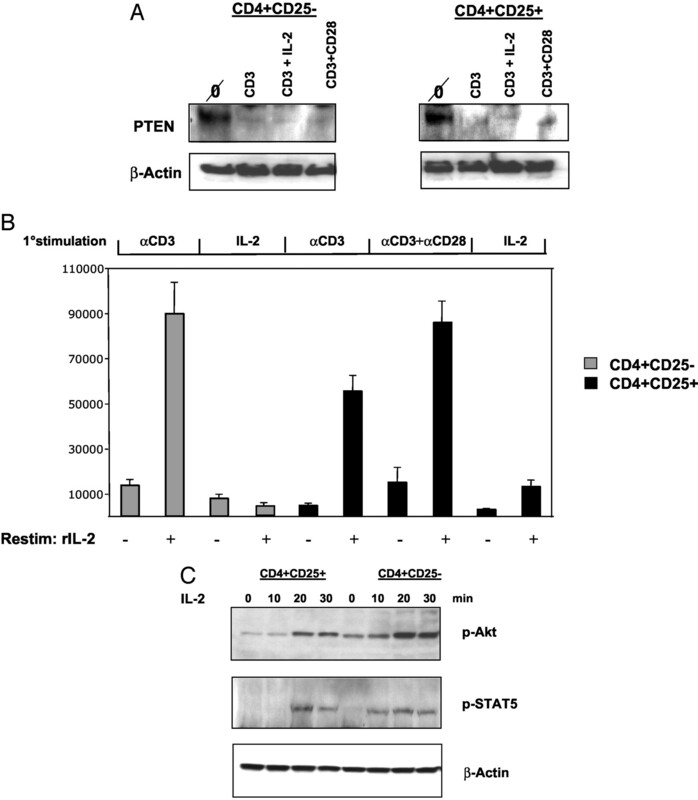 Negative regulation of phosphatidylinositol 3-kinase signaling and IL-2-mediated proliferation of CD4+CD25+ T cells is inversely associated with expression of the phosphatase and tensin homologue deleted on chromosome 10, PTEN. Interleukin-2 plays a central role in modulating immune responses, lymphocyte homeostasis, and tolerance induction of T lymphocytes (1). The high-affinity IL-2R is a heterotrimeric complex composed of the α-chain (CD25), β-chain (CD122), and the common γ-chain (CD132). Engagement of the IL-2R on activated T cells initiates a complex signaling program that can induce proliferation, increase survival, as well as prime for activation-induced cell death (2). More recently, studies on IL-2, CD25, and CD122 knockout mice have identified an essential role for IL-2 signals in the development and survival of CD4+CD25+ regulatory T cells (Tregs)4 (3, 4, 5). CD4+CD25+ Tregs are a distinct population of T lymphocytes that have the capacity to dominantly suppress the proliferation of responder T cells in vitro and inhibit autoimmune disease in vivo (6, 7). Despite expression of all three subunits of the high-affinity IL-2R, CD4+CD25+ T cells remain hypoproliferative when stimulated with IL-2 alone. However, combinations of signals, such as TCR and IL-2 or glucocorticoid-induced TNFR and IL-2, result in both the proliferation and the transient loss of suppressive characteristics (8, 9, 10). The molecular mechanism underlying these observations remains unknown. The current signaling paradigm of IL-2-mediated proliferation and survival in activated T cells requires a coordinated effort between multiple signaling pathways downstream of the IL-2R (11, 12). The IL-2R has no intrinsic catalytic activity and relies on the ligand-mediated heterodimerization of the IL-2R to initiate activation of extrinsic signaling molecules, such as the Janus kinase (JAK). These initial events result in the subsequent activation of the transcription factor STAT5, as well as the recruitment of the phosphatidylinositol 3-kinase (PI3K) and Ras-mitogen-activated protein kinase (MAPK) signaling pathways (1, 13). This complex signaling system ultimately results in the up-regulation of genes that are critical for cell cycle progression and survival. Although IL-2 is required for the development and peripheral survival of CD4+CD25+ T cells, their hypoproliferative response to IL-2 in vitro suggests a differential pattern of IL-2R signaling compared with their activated T lymphocyte counterparts. However, there is currently no information available regarding IL-2R signal transduction in primary CD4+CD25+ T cells. Given the central role of IL-2 in the biology of CD4+CD25+ T cells we sought to characterize the cellular and molecular responses of these cells to IL-2R signals. In this report, we demonstrate that CD4+CD25+ T cells have a distinct IL-2R signaling pattern. Engagement of the IL-2R on Tregs results in the activation of the JAK/STAT signaling pathway, but fails to activate downstream targets of the PI3K signaling pathway, such as Akt or p70s6kinase. This failure to activate PI3K/Akt does not abrogate the antiapoptotic effect of IL-2 on Tregs. Examination of IL-2-dependent PI3K signaling in CD4+CD25+ T cells reveals that negative regulation of the PI3K signaling pathway is inversely associated with expression of the lipid phosphatase and tensin homologue deleted on chromosome 10, PTEN. Taken together, these results demonstrate a unique IL-2R signaling pattern, which may define how IL-2 mediates the development and survival of CD4+CD25+ T cells without inducing a significant mitogenic response in vitro. BALB/c mice were purchased from The Jackson Laboratory (Bar Harbor, ME) and maintained under specific pathogen-free conditions in the animal facilities of the University of Pennsylvania, Philadelphia, PA.
All cells were grown in RPMI 1640 (Mediatech Cellgro, Herndon, VA) supplemented with 10% heat-inactivated FCS, 100 U/ml penicillin, 100 μg/ml streptomycin, 2 mM l-glutamine, 10 mM HEPES (all from Life Technologies, Rockville, MD), 50 μM 2-mercaptoethanol (Sigma-Aldrich, St. Louis, MO). FITC and biotin-anti-CD25 (7D4), FITC and allophycocyanin-anti-CD4 (RM4-5), PE–anti-CD122 (TM-β1), PE-anti-CD132 (4G3), Streptavidin-PE, purified anti-B220 (RA3), anti-MHC class II (M/5114), and purified anti-CD3 (2C11) were purchased from BD PharMingen (San Diego, CA). Murine rIL-2 was purchased from R&D Systems (Minneapolis, MN). Cells were analyzed on a Becton Dickinson FACSCaliber (BD Biosciences, Mountain View, CA) using FloJo software (Tree Star, San Carlos, CA). Anti-STAT5, anti-phospho-STAT5, anti-Akt, anti-phospho-Akt, anti-p70s6kinase, anti-phospho-p70s6kinase, anti-PTEN, and anti-actin Abs (all from Cell Signaling Technology, Beverly, MA), and anti-bcl-xL (Santa Cruz Biotechnology, Santa Cruz, CA) were used for Western blot analysis. Lymph node and spleen cells were initially prepared by lysing erythrocytes with ACK lysis buffer (BioWhittaker, Walkersville, MD). Cell preparations were then enriched for T cells by negative selection. Single cell suspensions were incubated with purified anti-B220 (RA3) and anti-MHC class II (M/5114) (BD Pharmingen) at 1 μg/ml for 30 min at 4°C followed by incubation with microbead-conjugated goat anti-rat IgG (Polysciences, Warrington, PA) for 30 min at 4°C. Cell preps were placed on a magnetic stand for 10 min and the negative fraction was harvested. Single cell suspensions of ∼3 × 108 were subsequently labeled with biotin-anti-CD25 (7D4), allophycocyanin-anti-CD4 (RM4-5), and Streptavidin-PE and purified by flow cytometry on a FACSVantage Cell Sorter (BD Biosciences). The percentage of CD4+CD25+ T cells was typically 4–6% of the overall T cell pool and the purity of sorted CD4+CD25+ T cells was consistently >95%. These cells functioned as Tregs when assessed for their ability to suppress CD4+CD25− T cell proliferation in vitro coculture assays (data not shown). FACS-sorted CD4+CD25+ or CD4+CD25− cells (1 × 106 cells/ml) were cultured in complete medium in 48-well plates (Costar, Corning, Corning, NY) with or without 100 U/ml murine rIL-2 (R&D Systems) for 96 h. Absolute cell numbers were determined by counting cells on a hemocytometer using trypan blue (Sigma-Aldrich) exclusion. In addition, cells were stained with the vital dye 7-amino actinomycin D (7-AAD; Calbiochem, La Jolla, CA) and cell viability was assessed by flow cytometry. Latex beads (Interfacial Dynamics, Portland, OR) were coated with either anti-CD3 (2 μg/ml) and/or anti-CD28 (10 μg/ml) as previously described (14), and resuspended at 3 × 106 beads/ml. FACS sorted CD4+CD25+ or CD4+CD25− cells (1 × 106 cells/ml) were rested overnight in complete medium at 37°C of 5% CO2 and then stimulated with anti-CD3 (10 μg/ml) and/or anti-CD28 (10 μg/ml) coated beads for the indicated times at a 3:1 ratio of beads to T cells. Cells were subsequently lysed and analyzed by Western blotting. FACS sorted CD4+CD25+ or CD4+CD25− cells (1 × 106 cells/ml) were rested overnight in complete medium at 37°C of 5% CO2 and then stimulated with 100 U/ml IL-2 (R&D Systems) for the time indicated, or cultured in 96-well plates (Costar, Corning) with T-depleted irradiated (2500 rads) BALB/c APCs (2 × 106 cells/ml) and 1 μg/ml anti-CD3 for 72 h at 37°C of 5% CO2. Cells were subsequently washed and rested overnight in complete medium, then stimulated with 100 U/ml IL-2 as previously mentioned. Cells were then lysed and analyzed by Western blotting (see below). “Primed” CD4+ T cells referred to in this study indicate CD4+CD25− T cells activated with anti-CD3, with or without anti-CD28 as indicated, to induce expression of the high-affinity IL-2R. Cells were lysed at 4°C at a concentration of 1 × 104 cells/μl. The lysis buffer was composed of 50 mM Tris-HCL (pH 6.8), 0.2% 2-mercaptoethanol, 20% glycerol, 4% SDS, and 0.001% bromphenol blue (all from Sigma-Aldrich). Cell lysates were clarified by centrifugation at 11,000 × g for 10 min. Supernatants were boiled for 10 min, separated on a 10% SDS-PAGE gel at ∼1 × 106 cell equivalents/well, and blotted onto Hybond ECL nitrocellulose membranes (Amersham Pharmacia Biotech, Buckinghamshire, U.K.). The membranes were blocked overnight in blocking reagent (Boehringer Mannheim, Mannheim, Germany) at 4°C and probed with indicated Abs at 1/1000 dilution overnight at 4°C. Membranes were washed and probed with a HRP-conjugated anti-rabbit or anti-mouse Ab at 1:1000 for 60 min at room temperature. Blots were visualized by ECL (Roche Diagnostics, Indianapolis, IN) according to the manufacturer’s protocol and on Hyperfilm ECL (Amersham Pharmacia Biotech). Abs were subsequently stripped off membranes for reprobing using Restore Western Blot Stripping buffer (Pierce, Rockford, IL), and reprobed as previously described. CD4+CD25+ T cells were isolated by flow cytometry as previously described. For control purposes, BALB/c total splenocytes were stimulated for 48 h with soluble anti-CD3 before washing and rested in serum-free medium for 4 h. Cells (6 × 106/sample) were stimulated with rIL-2 (R&D Systems) for the indicated time points and subsequently lysed in RIPA buffer at 4°C for 30 min. Debris was separated by centrifugation at 12,000 × g for 15 min at 4°C. To immunoprecipitate PI3K, lysates were incubated overnight at 4°C with 2.5 μg anti-p85 (Upstate Biotechnology, Lake Placid, NY) followed by incubation at 4°C for 4 h with 25 μl of protein A-agarose beads (15, 16). Precipitated protein pellets were washed twice with ice-cold RIPA lysis buffer and twice with ice-cold kinase buffer before resuspension in 20 μl of kinase buffer (40 mM HEPES, pH 7.5, 2 mM EGTA, 6 mM MgCl2, 1 mM DTT, 2.5 mM PMSF, 5 mM NaCl, 0.2 mM EDTA, and 10 μM unlabelled ATP). Lipid substrate (phosphatidylinositol; Matreya, State College, PA) was freshly prepared by the addition of 1% v/w cholic acid and sonication for 5 min on ice. A total of 10 μg of lipid substrate was added to each sample followed by incubation at 25°C for 10 min. This was followed by the addition of 20 μCi (0.74 MBq) of [γ-32P]ATP per sample and a further incubation of 20 min at 25°C. The reaction was stopped by the addition of 5 N HCl (20 μl) and was then extracted with 160-μl mixture of chloroform-methanol (60:100) and nonaqueous fraction was separated by thin layer chromatography and developed with CHCl3/MeOH/NH4OH/H2O (129:114:15:21). TLC plates were dried at room temperature and visualized by autoradiography. CD4+CD25+ T cells (3 × 106) were cultured in the presence or absence of rIL-2 (100 U/ml) for 12 h. Alternatively CD4+CD25− T cells were stimulated with plate bound anti-CD3 (10 μg/ml) for 24 h to induce functional IL-2R expression (data not shown) and washed extensively before culture in the presence or absence of rIL-2 (100 U/ml) for a further 12 h. After stimulation RNA was purified using RNeasy columns (Qiagen, Valencia, CA) according to manufacturers instructions. Total RNA was quantitatively amplified using two cycles of standard cDNA synthesis and in vitro transcription as previously described (17). In the second cycle of IVT synthesis, biotin-ribonucleotides were incorporated to produce labeled antisense RNA (Enzo Bioarray; Enzo Diagnostics, Farmingdale, NY). Labeled cRNA was fragmented at 94°C for 35 min in fragmentation buffer (40 mM Tris acetate, pH 8.1, 30 mM MgOAc, 100 mM KOAc) and subsequently hybridized to MG U74Av2 chips (Affymetrix, Santa Clara, CA) and stained with Streptavidin-PE as per manufacturers instructions. Analysis of DNA microarray data was conducted using Microarray Suite 5.0 software using manufacturer recommended parameters (Affymetrix). Two independent experiments were conducted for each stimulation condition. For alterations in expression to be classified as “real,” a specific gene probe was required to be called as increased or decreased with a signal log ratio of at least one in two independent experiments. Fold increase or decrease in expression as shown in Table I⇓ is calculated from signal log ratio values. FACS-purified CD4+CD25− and CD4+CD25+ cells were cultured either in the presence of rIL-2 (100 U/ml) or plate bound anti-CD3 with or without anti-CD28 for 48 h. After 48 h cells were washed and replated either in the presence or absence of rIL-2 (20 U/ml) for a further 48 h. Cultures were pulsed with [3H]thymidine for the final 16 h and harvested. All proliferation experiments were set up in triplicate and results are expressed as a mean of triplicates. For cell cycle analysis, 1 × 105 freshly isolated or cultured CD4+CD25+ T cells were fixed in 1 ml of 70% cold ethanol, and stored at −20°C overnight. Samples were centrifuged at 250 × g and supernatants were aspirated. Cell pellets were resuspended with 400 μL of a solution containing: 0.5 ml of propidium iodide (20 μg/ml, Sigma-Aldrich), 1000 U of RNase A (10 mg/ml, heat-inactivated in TE buffer, Sigma-Aldrich), and 10 ml of buffer (1 g/ml glucose in 1× PBS). Cells were stained for 30 min at room temp and subsequently analyzed on a FACSCalibur for DNA content. Recent work has demonstrated that IL-2 signals are required for the maintenance of CD4+CD25+ T cells in vivo (3, 4). To directly determine whether exogenous IL-2 could protect Tregs from apoptosis in vitro, FACS purified CD4+CD25+ or CD4+CD25− T cells were cultured in medium for 96 h with or without exogenous IL-2, subsequently stained with the vital dye 7-AAD, and examined by flow cytometry. Although the addition of IL-2 to CD4+CD25− T cells in culture had little effect on their viability, titration of exogenous IL-2 into cultures demonstrated that <3 U/ml IL-2 markedly increased the survival of CD4+CD25+ T cells (Fig. 1⇓A). Similarly, absolute cell counts determined by trypan blue exclusion on a hemocytometer demonstrated that the addition of IL-2 to CD4+CD25+ T cells in culture over a 96-h period resulted in an ∼5-fold increase in the number of cells recovered when compared with cells cultured in medium alone (data not shown; p > 0.001). 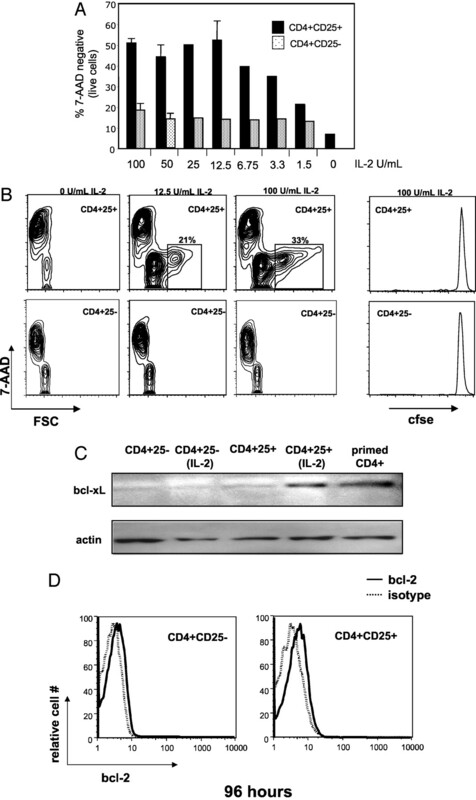 CD4+CD25+ T cells cultured in the presence of exogenous IL-2 exhibited marked cellular enlargement (Fig. 1⇓B) and enhanced cell survival occurred without any appreciable cell division as assessed by CFSE dilution (Fig. 1⇓B, right panel). These observations are consistent with the known inability of IL-2 alone to induce the proliferation of highly purified CD4+CD25+ T cells (7). The ability of IL-2 to promote the survival of CD4+CD25+ Tregs was associated with induction of bcl-xL protein (Fig. 1⇓C), whereas the effects on bcl-2 levels were far more modest, with only a minimal and variable increase seen (Fig. 1⇓D). IL-2 mediates the survival and cellular enlargment of CD4+CD25+ T cells in vitro. CD4+CD25+ and CD4+CD25− cells were sorted by flow cytometry, CFSE labeled and cultured in complete medium alone or with increasing concentrations of IL-2 as indicated for 96 h. A, B, and D, Cells were stained with the vital dye 7-AAD or fixed permeabilized and stained with anti-Bcl-2 before analysis by flow cytometry. Results are representative of five independent experiments. C, Cells cultured as in A were lysed and electrophoresed on a SDS-PAGE gel, transferred to nitrocellulose membranes, and probed with anti-bcl-xL, or anti-actin as indicated. Primed CD4+ T cells stimulated with anti-CD3 for 96 h were used as a positive control for bcl-xL expression. Results are representative of four independent experiments. The high-affinity IL-2R is a heterotrimeric complex composed of the α-chain (CD25), β-chain (CD122), and common γ-chain (CD132). Binding of IL-2 to the IL-2R initiates a complex signaling cascade that can drive the proliferation of Ag-activated T cells. Although CD4+CD25+ Tregs appear to constitutively express all three subunits of the IL-2R (3, 18 and data not shown), studies on CD4+CD25+ T cells have clearly demonstrated that these cells are hypoproliferative to IL-2 in vitro (7). To better understand the mechanism(s) by which CD4+CD25+ T cells remain hypoproliferative to IL-2 signals, we sought to characterize signaling events downstream of the IL-2R. Previous studies on IL-2R signaling have shown that activation of both the JAK/STAT and PI3K/Akt pathways are critical for IL-2-induced proliferation (11, 12, 19, 20, 21). Thus, we examined the activation state of STAT5 and Akt downstream of the IL-2R in CD4+CD25+ T cells. To this end, purified CD4+CD25+ T cells or CD4+CD25− T cells, were rested overnight in medium and subsequently stimulated with 100 U/ml IL-2 for 30 min. In addition, to serve as a positive control for IL-2R signaling in this and future experiments, CD4+ T cells (designated “primed CD4+” in the study) were activated with anti-CD3 for a period of 72 h to induce expression of the high-affinity IL-2R, rested overnight, and then stimulated with IL-2 as indicated. Similar to primed CD4+ T cells, we observed expression of phosphorylated STAT5 in response to IL-2 in CD4+CD25+ T cells (Fig. 2⇓A). Primed CD4+ T cells also phosphorylated Akt following incubation with IL-2. In contrast, we could not detect phosphorylated Akt in CD4+CD25+ T cells stimulated with IL-2 for 2, 10, or 30 min (Fig. 2⇓A and data not shown). CD4+CD25+ T cells have distinct IL-2R signaling that mediates survival independent of PI3K. A, CD4+CD25+ or CD4+CD25− T cells sorted by flow cytometry and primed CD4+ T cells were rested overnight in medium and subsequently stimulated with 100 U/ml IL-2 for 30 min. Samples were lysed and electrophoresed on an SDS-PAGE gel, transferred to nitrocellulose membranes, and probed as indicated. The same experiment (Ai and Aii) and the independent experiment (Aiii) are shown. Results are representative of three experiments. B, Purified CD4+CD25+ T cells (left) were cultured in medium or medium plus 100 U/ml IL-2. In addition, indicated wells received the PI3K inhibitor LY294002 at time 0. At 96 h, cells were stained with the vital dye 7-AAD and analyzed by flow cytometry. Results are representative of two independent experiments. CD4+ T cells (right) were CFSE labeled and activated for 24 h to induce IL-2R expression without detectable cell division. Cells were washed extensively, pretreated for 2 h with LY294002 at the indicated concentration and then stimulated with IL-2 for a further 72 h at which point cells were assessed for CFSE dye dilution (C, bottom) as well as 7-AAD incorporation (B, right). For analysis of Akt phosphorylation primed CD4+ T cells were pretreated as described with LY294002 and then stimulated with IL-2 for 30 min. Samples were lysed and probed with anti-phospho-Akt or Akt (C, top) by Western blot as indicated. To determine whether the failure to activate Akt by IL-2R stimulation was restricted to Akt or was indicative of a broader defect in PI3K signaling, we examined the activation of another downstream target of PI3K, the cell cycle regulator p70s6kinase (20). Similar to the observed differential pattern of Akt phosphorylation, we found that phosphorylation of p70s6kinase in response to IL-2 occurs in primed CD4+ T cells, but not in CD4+CD25+ T cells (Fig. 2⇑A). Taken together, these data demonstrate that IL-2R signaling in CD4+CD25+ Tregs is distinct from activated or primed CD4+ T cells. Previous studies on activated T cells have shown that PI3K signaling and activation of Akt are critical for the antiapoptotic effects of IL-2 (22). The ability of IL-2 to increase the viability of CD4+CD25+ T cells (Fig. 1⇑, A and B, left panel) without the apparent activation of Akt (Fig. 2⇑A) suggested that this effect did not require the activation of downstream PI3K targets. To confirm that the IL-2-mediated survival of Tregs was occurring in a PI3K-independent manner, CD4+CD25+ T cells were cultured with 100 U/ml IL-2 in the presence of increasing doses of the PI3K chemical inhibitor LY294002 (23) for 96 h. At concentrations sufficient to inhibit IL-2-mediated activation of Akt as well as proliferation of primed CD4+ T cells (Fig. 2⇑C), we found that LY294002 did not inhibit IL-2-mediated survival of Tregs or primed CD4+ T cells (Fig. 2⇑B). We have observed a distinct pattern of IL-2R signaling in Tregs. To broadly determine whether IL-2R signaling in CD4+CD25+ T cells was capable of initiating transcriptional activity, we compared the gene expression profile of IL-2-stimulated primed CD4+ T cells or CD4+CD25+ T cells. Using cDNA microarray analysis we found that IL-2R signaling altered transcription of significantly fewer genes in CD4+CD25+ cells when compared with primed CD4+ cells (71 vs 229) (Fig. 3⇓A). This included both a reduction in the number of genes up-regulated (67 vs 120), and more strikingly, a large disparity in the number of genes down-regulated (4 vs 109). Further analysis of the gene array data revealed that the expression of 15 gene transcripts was altered both in CD4+CD25+ T cells and in primed CD4+ T cells after stimulation with IL-2 (see Table I⇑). Significantly, of these 15 genes almost one-half (IL-2Rα, suppressor of cytokine signaling (SOCS)-1 and SOCS-2, cytokine-inducible SH2-containing protein, c-Myc, bcl-2, and TNF-β) have been previously characterized to be downstream of JAK/STAT-mediated signaling pathways (24, 25, 26, 27, 28, 29). These data demonstrate that IL-2R signaling in CD4+CD25+ T cells, although differing markedly from that observed in primed CD4+ T cells, is sufficient to initiate transcription and results in the specific up-regulation of several known STAT5-dependent genes. IL-2R signaling mediates a distinct pattern of gene transcription and cell cycle progression in CD4+CD25+ T cells. A, CD4+CD25+ T cells or rested primed CD4+ T cells were cultured in medium or medium plus IL-2 (100 U/ml) for 12 h. Total RNA was amplified and labeled with biotinylated ribonucleotides before hybridization to MGU74Av2 chips. Chips were subsequently stained and scanned as per manufacturers instructions. The number of genes with significantly increased or decreased expression (at least 2-fold) in two independent experiments per individual stimulation was determined using Microarray Suite (MAS 5.0) software. CD4+CD25+ T cells sorted by flow cytometry were either analyzed immediately or cultured in medium with IL-2 for the times indicated. B, Cells were lysed and probed with anti-cyclin D3, anti-p27kip, anti-myc, or anti-actin by Western blot as indicated. C, CD4+CD25+ cells and primed CD4+ T cells were stimulated with IL-2, fixed in cold ethanol, and stained for DNA content with propidium iodide. Results are representative of three independent experiments. STAT5-mediated up-regulation of cyclin D3 and c-myc and PI3K dependent down-regulation of p27kip have been reported to play a critical role in IL-2-mediated cell cycle progression (11, 12, 30). Movement of cells out of G0 into G1 is characterized by the up-regulation of the G1 cyclins whereas movement out of G1 requires the down-regulation/degradation of the cell cycle inhibitor p27kip (31). 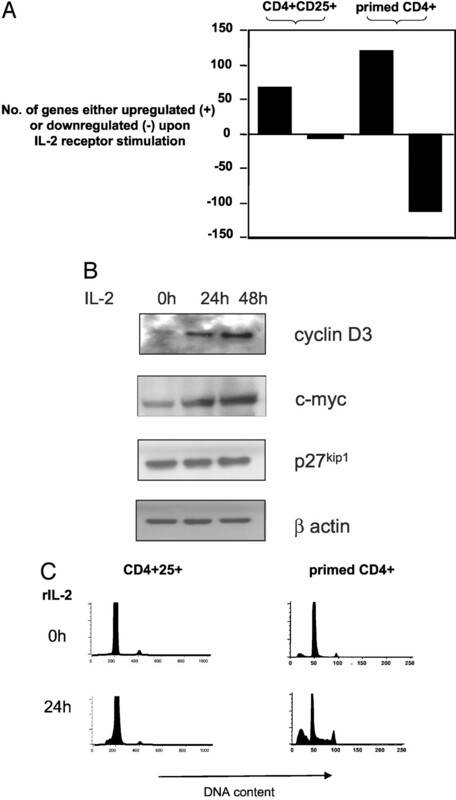 Analysis of these cell cycle-associated proteins demonstrated that stimulation of Tregs with IL-2 led to the up-regulation of cyclin D3 and c-myc, but failed to down-regulate p27kip (Fig. 3⇑B). Propidium iodide staining for DNA content confirmed that IL-2 stimulation induced Tregs to arrest in G1 phase of the cell cycle (Fig. 3⇑C). These observations are consistent with our microarray data as well as being in agreement with our initial observations on the failure of IL-2 to activate signaling pathways downstream of PI3K in Tregs (Fig. 2⇑A). The previous data indicate that IL-2 stimulation of CD4+CD25+ T cells does not activate downstream targets of the PI3K signaling pathway. Possible explanations for this observation include 1) CD4+CD25+ T cells are incapable of activating PI3K regardless of the stimulus, 2) a failure to activate PI3K specifically downstream of the IL-2R, or 3) downstream mediators of PI3K signaling, such as phosphatidylinositol 3,4,5-trisphosphate (PIP3), are negatively regulated in Tregs. To address these possibilities, we asked whether Akt could be activated in response to other stimuli, such as TCR signals or costimulation. FACS sorted CD4+CD25+ T cells were rested overnight in culture medium and stimulated with anti-CD3, anti-CD3 plus IL-2 or anti-CD3 plus anti-CD28 for 30 min. Cells were subsequently lysed and probed for phosphorylated Akt or phosphorylated STAT5 by Western blot. TCR signals alone or in conjunction with IL-2 did not activate Akt in Tregs (Fig. 4⇓A). However, we could detect phosphorylated Akt in response to anti-CD3 plus anti-CD28 or anti-CD28 alone (Fig. 4⇓A and data not shown), indicating that PI3K can be activated in CD4+CD25+ T cells. STAT5 phosphorylation confirmed our earlier observation that IL-2 is capable of STAT5 activation in CD4+CD25+ T cells. Thus, CD28 cross-linking is capable of activating the PI3K signaling pathway, ruling out an intrinsic defect in PI3K activity in Tregs. IL-2 activates PI3K and negative regulation of PI3K signaling occurs downstream of PI3K. A, Purified CD4+CD25+ T cells were stimulated with IL-2 (100 U/ml) in combination with latex beads precoated with mAbs to anti-CD3 (2 μg/ml) and anti-CD28 (10 μg/ml) as indicated for 30 min. Cell lysates (1 × 106 cells/sample) were prepared and analyzed as indicated. B, Primed CD4+ T cells and purified CD4+CD25+ were stimulated with IL-2 (100 U/ml) for the times indicated. Cells were lysed, PI3K was immunoprecipitated overnight, and specific enzyme activity was measured by in vitro kinase reaction and TLC as per Materials and Methods. Migration of specific PIP3 product was determined using unlabelled PIP3 and revealed using iodine crystals. Results are representative of three experiments. C, Isolated CD4+CD25+ or CD4+CD25− T cells were either analyzed immediately or cultured in medium with 100 U/ml IL-2 for 96 h. Activated CD4+ T cells were rested overnight and stimulated with 100 U/ml IL-2 for 24 h. Samples were lysed and probed with anti-SHIP, anti-PTEN, or anti-actin by Western blot as indicated. Results are representative of three experiments. Activation of PI3K by CD28 and the IL-2R differ in that the IL-2R does not have intrinsic docking sites for PI3K (32). Activation of PI3K by IL-2 relies on the assembly of a scaffolding complex composed of proteins, such as SHC and Grb2, which leads to the subsequent recruitment of PI3K to the IL-2R (33). Once activated, PI3K signaling is negatively regulated by the lipid phosphatases PTEN and Src homology 2-containing inositol polyphosphate 5-phosphatase (SHIP)-1, which convert active lipid messengers to less active intermediates (34). Therefore, the failure to activate Akt downstream of the IL-2R in CD4+CD25+ T cells could result from either the inability to assemble this proximal PI3K signaling complex or the negative regulation of PI3K signaling intermediates. To distinguish between these possibilities, an in vitro PI3K assay was used. In this assay, the activation of PI3K by IL-2 is measured by determining IL-2-mediated phosphorylation of PI3K substrates in vitro. As indicated in Fig. 4⇑B, stimulation of CD4+CD25+ T cells with IL-2 led to the induction of specific PI3K activity, similar to that observed in IL-2-stimulated activated CD4+ T cells (11). Thus, proximal IL-2R signaling in CD4+CD25+ T cells is sufficient to activate PI3K and suggests that regulation of this pathway lies downstream of PI3K. Having determined that IL-2 activates PI3K in Tregs, we next examined the expression pattern of the lipid phosphatases PTEN and SHIP-1 in naive CD4+, CD4+CD25+, and primed CD4+ T cells. 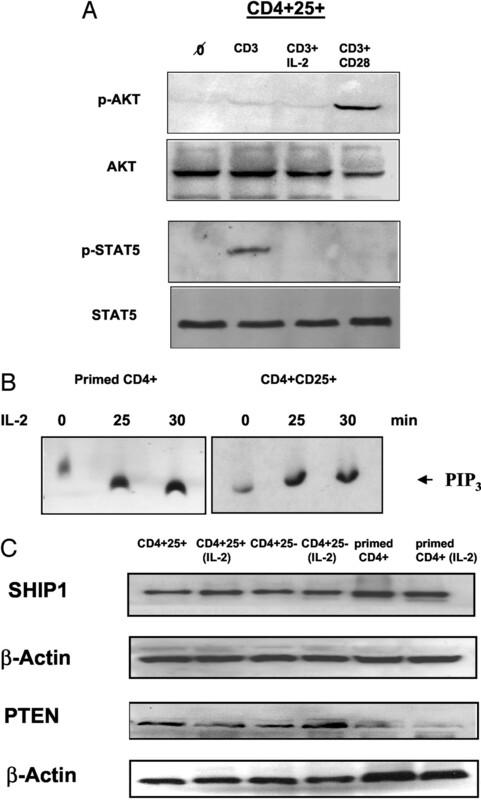 Western blot analysis revealed that both PTEN and SHIP-1 are expressed at high levels in naive CD4+ and CD4+CD25+ T cells, whereas primed CD4+ T cells had low levels of PTEN, but maintained SHIP-1 expression (Fig. 4⇑C). The expression pattern of PTEN in CD4+CD25+ and primed CD4+ T cells mimics observed PI3K activity and IL-2 responsiveness, suggesting a potential mechanism for the negative regulation of the PI3K pathway distal to the IL-2R in CD4+CD25+ T cells. CD4+CD25+ T cells are hypoproliferative to either TCR or IL-2R stimulation alone, however both of these signals in combination restores the proliferative capacity of Tregs (7), which can be subsequently maintained by IL-2 alone (our unpublished observation). We have observed that PTEN expression levels inversely correlate with the proliferative response of primed CD4+ T cells to exogenous IL-2 as well as the hypoproliferative phenotype of CD4+CD25+ T cells to IL-2 signals. Therefore, we sought to determine whether TCR stimulation of CD4+CD25+ T cells altered the expression of PTEN. As shown in Fig. 5⇓A, TCR or TCR/CD28 stimulation resulted in the down-regulation of PTEN after 72 h.
Activation of TCR down-regulates PTEN and restores IL-2-mediated PI3K signaling. A, Purified CD4+CD25+ and CD4+CD25− T cells were stimulated with anti-CD3 (0.5 μg/ml) alone or in combination with anti-CD28 (2 μg/ml) or IL-2 (100 U/ml) and T-depleted, irradiated APCs for 72 h. Samples were lysed and probed with anti-PTEN or anti-actin by Western blot as indicated. Results are representative of three experiments. B, CFSE labeled CD4+CD25+ and CD4+CD25− T cells were stimulated with anti-CD3 (0.5 μg/ml), anti-CD28 (5 μg/ml), IL-2 100 U/ml and T-depleted, irradiated APCs for 48 h and analyzed by flow cytometry (data not shown). 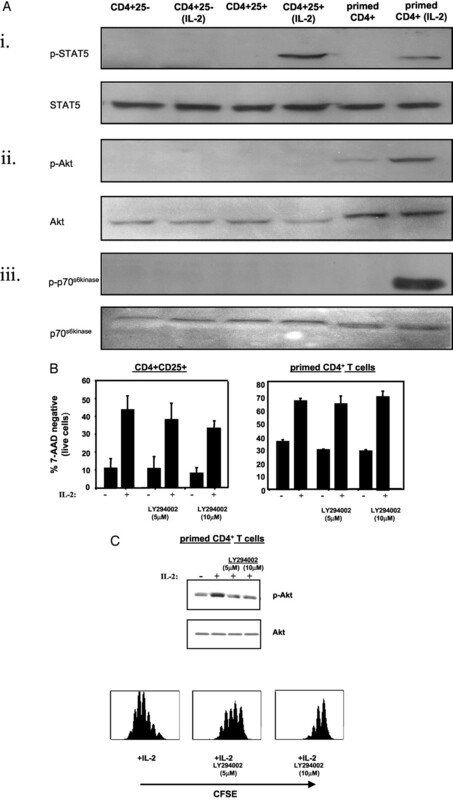 Cells were subsequently washed and replated in complete medium alone or with IL-2 (100 U/ml) for 48 h. [3H]Thymidine was added to cultures for the last 16 h. C, Purified CD4+CD25+ and CD4+CD25− T cells were stimulated with anti-CD3 (0.5 μg/ml), anti-CD28 (5 μg/ml) and T-depleted, irradiated APCs for 72 h, then rested for 6 h in complete medium. Cells were subsequently stimulated with 100 U/ml IL-2 for 30 min. Samples were lysed and probed by Western blot as indicated. Having established that TCR stimulation results in the down-regulation of PTEN in CD4+CD25+ T cells, we next asked whether TCR signals restore IL-2R competency to support IL-2-induced proliferation. To address this, CFSE labeled CD4+CD25+ T cells were cultured with IL-2 alone or plate-bound anti-CD3 with or without anti-CD28 for 48 h. As expected, CD4+CD25+ T cells did not undergo significant proliferation to IL-2 or anti-CD3 stimulation alone or with anti-CD28 during this period (data not shown). After 48 h, the cultured CD4+CD25+ T cells were washed and recultured in medium alone or with 20 U/ml IL-2 as indicated for a further 72 h. CD4+CD25+ T cells cultured with IL-2 underwent significant proliferation (Fig. 5⇑B), suggesting that indeed, an initial period of T cell activation restores IL-2R-mediated proliferation. It is noteworthy however that the level of IL-2-induced proliferation of Tregs after a period of preactivation with anti-CD3 alone is less than that observed in CD4+CD25− T cells under the same conditions. This observation raises the possibility that other unidentified factors intrinsic to Tregs besides PTEN may also play a role in their hyporesponsiveness to IL-2. We have demonstrated that TCR activation results in the down-regulation of PTEN and restores the ability of CD4+CD25+ T cells to proliferate to IL-2. Thus, we next asked whether TCR stimulation restored IL-2 mediated PI3K signaling. To this end CD4+CD25+ T cells were activated for 72 h with anti-CD3 and anti-CD28, rested in medium for 6 h and restimulated with IL-2 (Fig. 5⇑C). In contrast to freshly isolated CD4+CD25+ T cells (Fig. 2⇑A), activated CD4+CD25+ T cells phosphorylate Akt in response to IL-2. Taken together, these data demonstrate that TCR stimulation of CD4+CD25+ T cells primes the IL-2R for IL-2-mediated proliferation, coincides with the loss of PTEN, and the restoration of PI3K signaling downstream of the IL-2R. In contrast to naive T cells, CD4+CD25+ immunoregulatory T cells appear to constitutively express the α-, β-, and common γ-chain of the IL-2R (3, 18). Despite expression of the high-affinity IL-2R, initial characterization of CD4+CD25+ T cells demonstrated that these cells are hypoproliferative to IL-2 in vitro (7). One explanation for these data would be that Tregs do not express a “functional” IL-2R. However, subsequent studies have shown that CD4+CD25+ T cells require IL-2 and IL-2R signaling for their development and survival (3, 4, 5), suggesting that these cells are responsive to IL-2 signals. The mechanism(s) by which IL-2R signaling on CD4+CD25+ T cells promotes their development and survival, yet maintains their hypoproliferative phenotype is unknown. To that end, we have closely examined the cellular and molecular responses of CD4+CD25+ T cells to IL-2 in vitro. In this report we demonstrate that CD4+CD25+ T cells have a distinct IL-2R signaling pattern, which may in part explain their hypoproliferative phenotype while preserving IL-2-mediated survival. The molecular mechanism(s) that regulate cytokine or growth factor-induced cell cycle progression and survival remain incompletely understood. STAT5a and STAT5b are two closely related transcription factors that are activated by the IL-2R (35), and appear to be required for IL-2-mediated proliferation in activated T cells (12). Examination of STAT5a/STAT5b−/− T lymphocytes demonstrated a specific role for STAT5 in linking IL-2 signals to the cell cycle via the up-regulation of cell cycle proteins such as cyclin D2, cyclin D3, and cdk 6. However, these studies also demonstrated that assembly of the cell cycle machinery and cell cycle progression is not entirely dependent on STAT5 activation. Despite a defect in the expression of some cell cycle machinery, primed STAT5-deficient T cells are able to up-regulate the cell cycle proteins cdk2 and cdk4, as well as down-regulate p27kip in response to IL-2 (12). Thus, efficient cell cycle progression requires coordinated signaling from multiple signaling pathways. Similar to activated T cells, we find IL-2-mediated phosphorylation of STAT5 and up-regulation of the STAT5-dependent G1 cyclin D3 in CD4+CD25+ T cells. Additionally, we find that IL-2 stimulation initiates the transcription of several of STAT5-dependent genes, as well as the cell cycle associated transcription factor c-myc. Thus, we have concluded that the JAK/STAT5 signaling pathway appears to be intact in these cells. We find that IL-2 stimulation of Tregs increases cellular survival, which coincides with the up-regulation of the antiapoptotic molecule bcl-xL. Chemical inhibitors of PI3K and MAPK signaling did not block the IL-2-mediated survival of CD4+25+ T cells (Fig. 2⇑B and data not shown), thus, we concluded that JAK/STAT5 signaling pathway is critical for this IL-2 effect. Such a role of STAT5 in IL-2-mediated T cell survival has not been previously established. Examination of activated T cells expressing a mutated IL-2R, or from STAT5-deficient mice have shown that STAT5 activation is not necessary for IL-2-induced protection from apoptosis (2, 12). A clear caveat to these studies is that multiple signaling pathways are activated downstream of the IL-2R, and as such, STAT5-mediated survival may act in a redundant manner. In contrast, studies in cell lines expressing chimeric and/or mutated growth factor receptors demonstrated that activation of STAT5 protects cells from apoptosis via the up-regulation of bcl-2 and bcl-xL, independent of cell cycle progression (24). Likewise, further studies on STAT5-deficient mice have shown that activation of STAT5 by growth factors is required for the up-regulation of the antiapoptotic molecule bcl-xL and survival of erythroid progenitors (36). The PI3K signaling pathway plays a central role in growth factor-mediated cellular functions such as, proliferation, survival, growth, and glucose homeostasis. Activation of PI3K results in the production of 3′-phosphoinositide lipids, such as PIP3 and phosphatidylinositol 4,5-bisphosphate, which serve as lipid second messengers. These second messengers bind to the plextrin homology domains of target proteins and directly recruit a wide variety of downstream effector molecules, such as Akt, PDK1, and Itk. Studies on both the IL-2R and CD28 have demonstrated that PI3K signaling and activation of Akt plays an important role in promoting T cell survival and proliferation (11, 21, 22). Akt (protein kinase B) is a serine/threonine kinase that is a downstream target of PI3K signaling. Activation of Akt is thought to promote survival through a number of mechanisms including up-regulation of bcl-2 (37), phosphorylation of proapoptotic bad, and its subsequent sequestration away from antiapoptotic bcl-2 family members (38) as well as negatively controlling the activity of proapoptotic Forkhead Family transcription factors (39). However, our results indicate that the PI3K/Akt pathway is dispensable in cytokine-mediated survival of Tregs. In support of our observations, we demonstrate that 1) CD4+CD25+ T cells do not activate Akt in response to IL-2, 2) the PI3K chemical inhibitor LY294002 does not block the IL-2-mediated survival of Tregs, and 3) IL-2 leads to significant up-regulation of bcl-xL without significantly altering bcl-2 expression levels in these cells. Proximal IL-2R signaling in Tregs is sufficiently intact to activate PI3K, however downstream targets such as Akt do not get phosphorylated. Our data suggest that regulation of this signaling pathway occurs downstream of PI3K. The lipid phosphatase PTEN is a ubiquitously expressed protein, which has been characterized as a negative regulator of PI3K-mediated signaling, through its ability to dephosphorylate lipid substrates. PTEN (also referred to as mutated in multiple advanced cancers) is, as its name suggests, a potent tumor suppressor gene that is deleted or mutated in a variety of different forms of cancer (40). Complete inactivation of the gene in mice was found to be embryonic lethal and subsequent studies on hemizygous animals demonstrated a high incidence of spontaneous tumor development, impaired Fas-mediated apoptosis, as well as autoimmunity (41, 42). In this study we demonstrate that the inability of IL-2 to stimulate signaling pathways downstream of PI3K coincides with relatively high expression of PTEN in Tregs. Moreover down-regulation of PTEN through TCR stimulation appears to be permissive for a restoration of IL-2-mediated PI3K-dependent signaling and proliferative capacity in Tregs. These observations are in agreement with earlier observations that a combination of TCR and IL-2 signals are sufficient to reverse the hypoproliferative phenotype of Tregs (7). It is interesting that such a combination of signals does not appear to significantly activate Akt in the short term, e.g., 30 min (Fig. 4⇑A) perhaps due to maintained PTEN expression at these earlier time points. Indeed we have found that under such stimulation conditions PTEN degradation is detectable after ∼24 h and we also demonstrate that prolonged activation of Tregs (72 h) facilitates IL-2-dependent signaling downstream of PI3K (Fig. 5⇑C). IL-2 plays a critical role in the prevention of autoimmunity and the maintenance of lymphocyte homeostasis. One such mechanism for IL-2-mediated tolerance is via the development and survival of CD4+CD25+ T cells (3, 4, 5). In this study, we define a distinct pattern of IL-2R signaling in Tregs, which is regulated by PTEN and differs significantly from the established paradigm of IL-2R signaling. This signaling pattern appears to be crucial for the “anergic” phenotype of these cells to IL-2. Mice that are haploinsufficient for PTEN or have a T cell-specific PTEN deletion develop autoimmune disease (41, 43). In these models, it was demonstrated that effector T cells are hyperresponsive, however the Treg populations were not investigated. Thus, it will be of interest to determine the relative contribution of PTEN to the maintenance of T cell tolerance by specific T cell subsets. Our in vitro data suggest PTEN acts as a negative regulator of IL-2-mediated expansion of Tregs. Whether PTEN plays a role in their suppressive phenotype remains to be investigated. Taken together, these data describe a novel signaling paradigm that explains how IL-2 mediates the development and survival of CD4+CD25+ T cells without inducing a significant mitogenic response. We thank the University of Pennsylvania Cancer Center Flow Cytometry Core for expert assistance with FACS, and Galene Athanasiadis, Scott Adler, Marielena Mata, Adam Schrum, Don Baldwin, Jamil Dierov, Morrie Birnbaum, and Doreen Cantrell for helpful discussions. ↵1 This work was supported by the following National Institutes of Health Grants AI-37691, AI-41521, and AI-43626 (to L.A.T.). ↵2 S.J.B. and P.T.W. contributed equally to this work and should be considered co-first authors. ↵4 Abbreviations used in this paper: Treg, regulatory T cell; PI3K, phosphatidylinositol 3-kinase; PTEN, phosphatase and tensin homologue deleted on chromosome 10; PIP3, phosphatidylinositol 3,4,5-trisphosphate; MAPK, mitogen-activated protein kinase; SHIP, Src homology 2-containing inositol polyphosphate 5-phosphatase; JAK, Janus kinase; 7-AAD, 7-amino actinomycin; SOCS, suppressor of cytokine signaling. Waldmann, T. A., S. Dubois, Y. Tagaya. 2001. Contrasting roles of IL-2 and IL-15 in the life and death of lymphocytes: implications for immunotherapy. Immunity 14:105. Refaeli, Y., L. Van Parijs, C. A. London, J. Tschopp, A. K. Abbas. 1998. Biochemical mechanisms of IL-2-regulated Fas-mediated T cell apoptosis. Immunity 8:615. Malek, T. R., A. Yu, V. Vincek, P. Scibelli, L. Kong. 2002. CD4 regulatory T cells prevent lethal autoimmunity in IL-2Rβ-deficient mice: implications for the nonredundant function of IL-2. Immunity 17:167. Murakami, M., A. Sakamoto, J. Bender, J. Kappler, P. Marrack. 2002. CD25+CD4+ T cells contribute to the control of memory CD8+ T cells. Proc. Natl. Acad. Sci. USA 99:8832. Almeida, A. R., N. Legrand, M. Papiernik, A. A. Freitas. 2002. Homeostasis of peripheral CD4+ T cells: IL-2Rα and IL-2 shape a population of regulatory cells that controls CD4+ T cell numbers. J. Immunol. 169:4850. Sakaguchi, S., N. Sakaguchi, M. Asano, M. Itoh, M. Toda. 1995. Immunologic self-tolerance maintained by activated T cells expressing IL-2 receptor α-chains (CD25): breakdown of a single mechanism of self-tolerance causes various autoimmune diseases. J. Immunol. 155:1151. Thornton, A. M., E. M. Shevach. 1998. CD4+CD25+ immunoregulatory T cells suppress polyclonal T cell activation in vitro by inhibiting interleukin 2 production. J. Exp. Med. 188:287. Takahashi, T., Y. Kuniyasu, M. Toda, N. Sakaguchi, M. Itoh, M. Iwata, J. Shimizu, S. Sakaguchi. 1998. Immunologic self-tolerance maintained by CD25+CD4+ naturally anergic and suppressive T cells: induction of autoimmune disease by breaking their anergic/suppressive state. Int. Immunol. 10:1969. Shimizu, J., S. Yamazaki, T. Takahashi, Y. Ishida, S. Sakaguchi. 2002. Stimulation of CD25+CD4+ regulatory T cells through GITR breaks immunological self-tolerance. Nat. Immunol. 3:135. Moriggl, R., D. J. Topham, S. Teglund, V. Sexl, C. McKay, D. Wang, A. Hoffmeyer, J. van Deursen, M. Y. Sangster, K. D. Bunting, et al 1999. Stat5 is required for IL-2-induced cell cycle progression of peripheral T cells. Immunity 10:249. Gaffen, S. L.. 2001. Signaling domains of the interleukin 2 receptor. Cytokine 14:63. Ermann, J., V. Szanya, G. S. Ford, V. Paragas, C. G. Fathman, K. Lejon. 2001. CD4+CD25+ T cells facilitate the induction of T cell anergy. J. Immunol. 167:4271. Merida, I., P. Williamson, W. A. Kuziel, W. C. Greene, G. N. Gaulton. 1993. The serine-rich cytoplasmic domain of the interleukin-2 receptor β chain is essential for interleukin-2-dependent tyrosine protein kinase and phosphatidylinositol-3-kinase activation. J. Biol. Chem. 268:6765. Karnitz, L. M., L. A. Burns, S. L. Sutor, J. Blenis, R. T. Abraham. 1995. Interleukin-2 triggers a novel phosphatidylinositol 3-kinase-dependent MEK activation pathway. Mol. Cell. Biol. 15:3049. Eberwine, J., H. Yeh, K. Miyashiro, Y. Cao, S. Nair, R. Finnell, M. Zettel, P. Coleman. 1992. Analysis of gene expression in single live neurons. Proc. Natl. Acad. Sci. USA 89:3010. Levings, M. K., R. Sangregorio, M. G. Roncarolo. 2001. Human CD25+CD4+ T regulatory cells suppress naive and memory T cell proliferation and can be expanded in vitro without loss of function. J. Exp. Med. 193:1295. Ahmed, N. N., H. L. Grimes, A. Bellacosa, T. O. Chan, P. N. Tsichlis. 1997. Transduction of interleukin-2 antiapoptotic and proliferative signals via Akt protein kinase. Proc. Natl. Acad. Sci. USA 94:3627. Reif, K., B. M. Burgering, D. A. Cantrell. 1997. Phosphatidylinositol 3-kinase links the interleukin-2 receptor to protein kinase B and p70 S6 kinase. J. Biol. Chem. 272:14426. Kelly, E., A. Won, Y. Refaeli, L. Van Parijs. 2002. IL-2 and related cytokines can promote T cell survival by activating AKT. J. Immunol. 168:597. Gonzalez-Garcia, A., I. Merida, A. C. Martinez, A. C. Carrera. 1997. Intermediate affinity interleukin-2 receptor mediates survival via a phosphatidylinositol 3-kinase-dependent pathway. J. Biol. Chem. 272:10220. Lord, J. D., B. C. McIntosh, P. D. Greenberg, B. H. Nelson. 2000. The IL-2 receptor promotes lymphocyte proliferation and induction of the c-myc, bcl-2, and bcl-x genes through the trans-activation domain of Stat5. J. Immunol. 164:2533. Sadowski, C. L., T. S. Choi, M. Le, T. T. Wheeler, L. H. Wang, H. B. Sadowski. 2001. Insulin induction of SOCS-2 and SOCS-3 mRNA expression in C2C12 skeletal muscle cells is mediated by Stat5. J. Biol. Chem. 276:20703. Kim, H. P., J. Kelly, W. J. Leonard. 2001. The basis for IL-2-induced IL-2 receptor α chain gene regulation: importance of two widely separated IL-2 response elements. Immunity 15:159. Lu, L., J. Zhu, Z. Zheng, M. Yan, W. Xu, L. Sun, J. Theze, X. Liu. 1998. Jak-STAT pathway is involved in the induction of TNF-β gene during stimulation by IL-2. Eur. J. Immunol. 28:805. Sporri, B., P. E. Kovanen, A. Sasaki, A. Yoshimura, W. J. Leonard. 2001. JAB/SOCS1/SSI-1 is an interleukin-2-induced inhibitor of IL-2 signaling. Blood 97:221. Matsumoto, A., M. Masuhara, K. Mitsui, M. Yokouchi, M. Ohtsubo, H. Misawa, A. Miyajima, A. Yoshimura. 1997. CIS, a cytokine inducible SH2 protein, is a target of the JAK-STAT5 pathway and modulates STAT5 activation. Blood 89:3148. Wells, A. D., M. C. Walsh, J. A. Bluestone, L. A. Turka. 2001. Signaling through CD28 and CTLA-4 controls two distinct forms of T cell anergy. J. Clin. Invest. 108:895. Gillett, C. E., D. M. Barnes. 1998. Demystified: cell cycle. Mol. Pathol. 51:310. Fruman, D. A., L. C. Cantley. 2002. Phosphoinositide 3-kinase in immunological systems. Semin. Immunol. 14:7. Freeburn, R. W., K. L. Wright, S. J. Burgess, E. Astoul, D. A. Cantrell, S. G. Ward. 2002. Evidence that SHIP-1 contributes to phosphatidylinositol 3,4,5-trisphosphate metabolism in T lymphocytes and can regulate novel phosphoinositide 3-kinase effectors. J. Immunol. 169:5441. Lin, J. X., W. J. Leonard. 1997. Signaling from the IL-2 receptor to the nucleus. Cytokine Growth Factor Rev. 8:313. Socolovsky, M., A. E. Fallon, S. Wang, C. Brugnara, H. F. Lodish. 1999. Fetal anemia and apoptosis of red cell progenitors in Stat5a−/−5b−/− mice: a direct role for Stat5 in bcl-xL induction. Cell 98:181. Parsons, M. J., R. G. Jones, M. S. Tsao, B. Odermatt, P. S. Ohashi, J. R. Woodgett. 2001. Expression of active protein kinase B in T cells perturbs both T and B cell homeostasis and promotes inflammation. J. Immunol. 167:42. Datta, S. R., H. Dudek, X. Tao, S. Masters, H. Fu, Y. Gotoh, M. E. Greenberg. 1997. Akt phosphorylation of BAD couples survival signals to the cell-intrinsic death machinery. Cell 91:231. Tang, E. D., G. Nunez, F. G. Barr, K. L. Guan. 1999. Negative regulation of the forkhead transcription factor FKHR by Akt. J. Biol. Chem. 274:16741. Seminario, M. C., R. L. Wange. 2003. Lipid phosphatases in the regulation of T cell activation: living up to their PTEN-tial. Immunol. Rev. 192:80. Di Cristofano, A., P. Kotsi, Y. F. Peng, C. Cordon-Cardo, K. B. Elkon, P. P. Pandolfi. 1999. Impaired Fas response and autoimmunity in Pten+/− mice. Science 285:2122. Podsypanina, K., L. H. Ellenson, A. Nemes, J. Gu, M. Tamura, K. M. Yamada, C. Cordon-Cardo, G. Catoretti, P. E. Fisher, R. Parsons. 1999. Mutation of Pten/Mmac1 in mice causes neoplasia in multiple organ systems. Proc. Natl. Acad. Sci. USA 96:1563. Suzuki, A., M. T. Yamaguchi, T. Ohteki, T. Sasaki, T. Kaisho, Y. Kimura, R. Yoshida, A. Wakeham, T. Higuchi, M. Fukumoto, et al 2001. T cell-specific loss of Pten leads to defects in central and peripheral tolerance. Immunity 14:523.